1. Boil vermicelli till no hard solid core. Take out. Cool in cold water. Take out..
2. Wash mung bean sprout, poach and cool in cold water. Take out. 3. 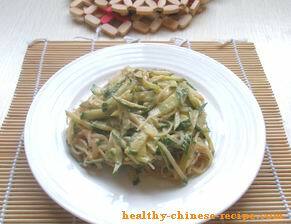 Wash cucumber, cut into thin strips. 4. Arrange the above cooled vermicelli, mung bean sprout, and cucumber thread in a big bowl or plate. 5. Making Sauce. Mix all the ingredients well. 6. Pour in the bowl or plate. Mix well, sprinkle crashed peanut. Stir evenly. Serve. You can adjust flavor to tailor your taste by tasting while adding additional salt, vinegar, garlic, etc. 1. If you want to use peanut butter and sesame paste, you need to dilute them. Below is the method. a.Put peanut butter and/or sesame paste in a bowl. b.Add in salt, vinegar, sesame oil. c.Stir at the same direction till the paste is diluted in the liquid and becomes sticky. d.Add water if it’s still dry and then stir till it’s diluted again. 2. This dish is very versatile. If you only have cucumber in hands you can do it. You can replace vermicelli with rice noodle, wheat flour noodle, or conjac noodle if you want to lose weight. Actually this is a weight loss dish. 3. At the beginning I mentioned this dish is popular in north of China. There are many vendors selling this dish on the street in summer. But no such cold dish in Guangzhou. Why? In hot day our Yang Qi is on the surface of our body. It's actually cold inside our body. Guangzhou is hot in almost all four seasons. If Cantonese want to cool and eat this cold dish almost every day, they will hurt their health. 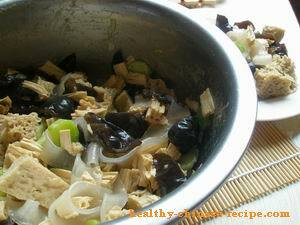 This is Broad Vermecilli with Fermented Gulten and Black Fungus Salad. You need big basin to mix the materials.